In May, we have added Tasks functionality (a tool to monitor the employees on the go) to our mobile app X-GPS Monitor. From now on a person in charge can monitor and control all the activities of his/her employees right from a smartphone or tablet and edit any tasks if needed. Let’s check how you can use it. You can proceed to the Tasks section from the main menu and see all the tasks grouped by the assignee. Unassigned tasks are arranged in groups. Tasks can be sorted by date or status. For example, here is the way you can see the incomplete tasks for today. You can also define some specific search criterion by using filter or search option at the top of the screen. All task fields, including tags, will be checked for matches and update search results after inserting every new symbol. After the needed task is found you can check on its details. What you need to do is just click on the task in the list. Apart from date and address, you can also find a detailed task description with the task destination zone displayed on the map. Moreover, you can build a route from your current location to the task destination. In case the task is not yet completed, it can be reassigned to another employee.You can do it from the task list or individual task card by selecting a new assignee. You can also remove the assignee from the task if needed by choosing ‘Unassigned’ in the list of employees. 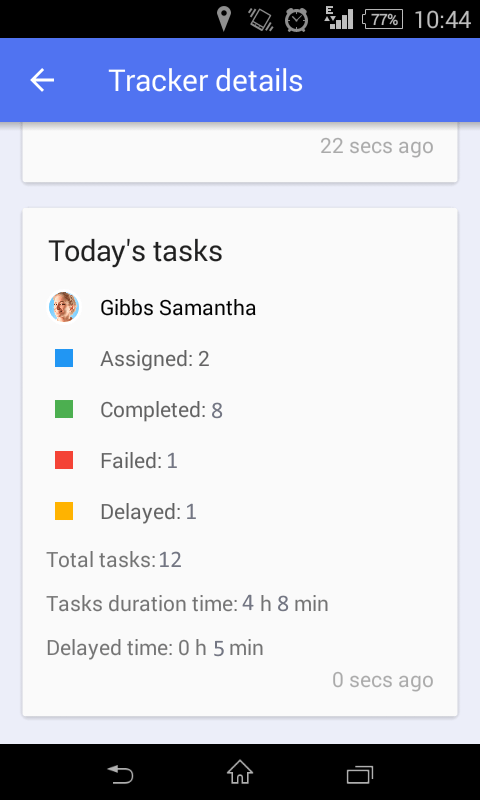 A separate widget shows summary about completed and failed tasks per day. This data can help you analyze the productivity of the each employee for the current date. New version of X-GPS Monitor is already available in PlayMarket and AppStore. In case your customers have used the previous version of mobile app, it will be updated automatically. If you have any questions related to our new version of X-GPS Monitor, please contact your manager.